Artpark Brownies are from Tender at the Bone, which is my favorite of all Ruth Reichl’s books. 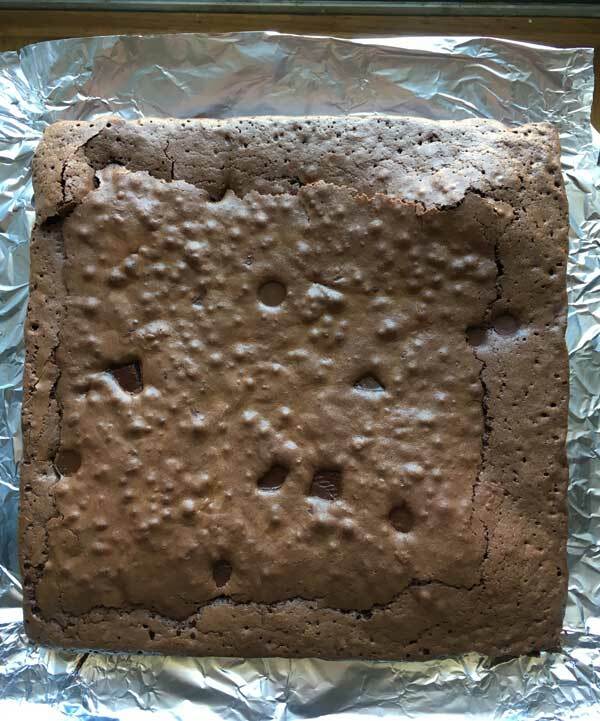 I’m not sure why I didn’t make the brownies back when I read the book, but it might have been because I did not own a stand mixer and didn’t want to beat the eggs and sugar for 10 minutes with my handheld. Now I do have a stand mixer and make these brownies often. The extended beating time gives the brownies a light, yet still fudgy texture and a flaky crust top crust. How shiny the brownies are seems to depend on what brand of chocolate I use. For instance, the brownies in the picture above were made with a mixture of unsweetened Lindt and Ghirardelli while the brownies in the older picture were made with unsweetened Ghirardelli. Thanks to the crust and the texture, they’re perfect for bake sales because you can wrap them in cellophane and they won’t smear all over the place even though the inside is moist and delicious. Another good thing about Artpark Brownies is they really showcase premium chocolate. I’m kicking myself for not picking up a bar of Valrhona at Central Market yesterday, but these were still awfully good with my standby, Ghirardelli. Update: It’s been years since I first made these, but I was reading through Maida Heatter’s Book of Great Chocolate Desserts and noticed this recipe is a modified version of one of Maida’s. Maida, who made these brownies as a little girl and sold them individually wrapped, baked hers in a 15×10 inch pan, therefore the brownies were much thinner. The Artpark Brownie batter is not scaled down. Instead, the same amount of batter as in Maida’s original recipe is poured into a 9 inch square pan resulting in a much thicker brownie. Another interesting thing is that Maida starts her oven at 450, then reduces it to 400 and bakes her thin brownies at 400 for 21 minutes. Artpark Brownies start at 400 and are then baked at 350 for about 40 minutes. These brownies are light and fudgy, yet rich at the same time. The key is to whip the eggs and sugar for 10 minutes. Preheat oven to 400 degrees F. Line a 9 inch square metal baking pan with nonstick foil or parchment paper. Melt butter in a saucepan. Reduce heat to low and add chocolate. Stir until melted; set aside. Alternately, you may melt them together in a double boiler or using the microwave. Beat eggs and salt in a stand mixer with the whisk attachment. With mixer going, gradually add sugar and continue to beat, increasing speed slightly, until mixture is pale and thick (about 10 minutes). Beat in the vanilla. Remove mixer from the stand and with a heavy duty scraper, stir in the melted chocolate. When chocolate is incorporated, stir in the flour. Scrape the batter into the pan and put in the oven. Immediately reduce heat to 350 degrees F.
Bake for about 40 minutes or until tops appear set. A toothpick inserted in the center will not come out clean at this point, so the regular toothpick test won't work. Let brownies cool completely. When cool, lift from pan and cut into large squares. For a cleaner cut, chill the brownies after they cool, then cut. Hooray! Glad you liked them, Natasha. this is a great recipe, they came out great. My first time making brownies from scratch cant wait to eat them!!!! These look flat-out delicious, as do most brownies I encounter (oh, to have a never-satisfied sweet tooth). Other than this recipe, can you recommend a never-fail in-between brownie? I need to impress a home ec teacher. Haha. I wonder how these would taste using brown sugar for half or all of the sugar? Mine were done in exactly 40. When I baked these two days ago, I had to bake them for about 60 minutes. I know they are to be fudgy (which they were……oh yummy!) Did you run into the same problem? Perhaps its time to get the old oven thermometer out again! I loved Tender at the Bone, along with y’all–especially the tales of her brother’s wedding and going to boarding school, eating meat sandwiches in Montreal. 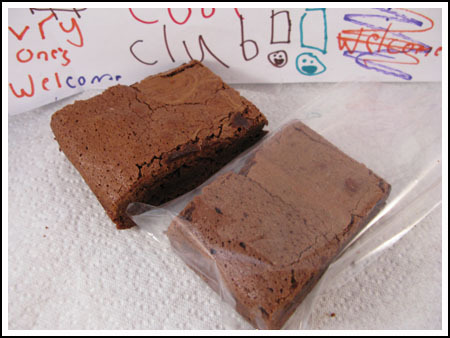 I had forgotten the brownies–they look like perfect lunchbox treats! (But I recall wanting to try the chocolate cake from the book, too). Sounds interesting. Similar to my standby, but way more sugar, slightly less chocolate, slightly more butter and one more egg. Oh, the brownie toothpick test is as follows: it should definitely NOT be clean, and you should be able to roll whatever is on it into a ball. Sue, I’ll have to look for that one. I consider all the recipes in the yellow Gourmet cookbook “Ruth’s” even though she is just the editor. LOL. Megan, they belong in your brownie trials for sure. I still haven’t made the triple chocolate. It’s been on my list for a while, but every time I’m ready to make it I’m missing something. Chris, I dont know. Apple Tarts sound really good. We’re having our first “fallish” day here in Austin and I like the idea of cooking with apples. Lisa, I am anxiously awaiting your wine cake report. I was going to make some apple tarts for dessert tonight, but after reading this, I might have to reconsider. Yum! That was one of my favorite books, too. Ruth is quite the storyteller! I’m going to have to try these – the long beating time certainly is unusual. And there’s nothing like starting off the week with brownies, in my opinion. grade-A huh? then I must give them a go! I love Ruth Reichl’s books! What a life!! I remember thinking I should make these brownies when I read that book. I also remember thinking I should try her devil’s food cake recipe, among others. I’m glad to know these are good!